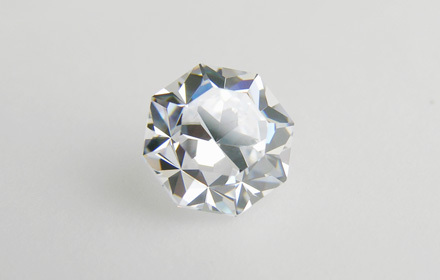 Weight: 1.17 ct; size: 5.13 | 5.11 | 3.62 mm; shape: octagon; colour: colourless; clarity: eye clean; cut: excellent. A cubic crystalline form of zirconium dioxide (ZrO2). A dense substance, with a specific gravity 5.6—6.0; relatively hard, 8—8.5; refractive index high at 2.15—2.18; dispersion very high at 0.058—0.066, exceeding that of diamond (0.044).